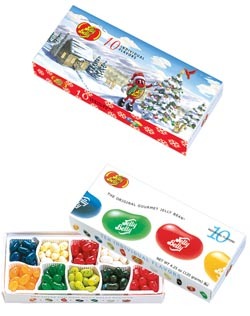 The Jelly Belly 10 Flavor Holiday Gift Box is a chameleon. When the holiday season is over, the box converts to a multi-season gift box. So IBDs can order the Holiday Gift Box now and enjoy sales the entire year. "The Holiday Gift Box is a great impulse buy item," says Karen Peterson of Lexco. "The winter scene fits right in with the holidays and beyond. Then dealers can just slip off the cover to reveal new box graphics for the rest of the year. Cyclists love Jelly Belly beans for their instant energy and great taste, and IBDs have found that Jelly Belly products sell best when displayed near check-out areas." The 4.25 ounce 10 Flavor Holiday Gift Box includes Jelly Belly's most popular flavors segregated into individual compartments. Each box features a guide to combining flavors into fun new flavorful tastes. And the gift box is the perfect, well, gift. Says Wendy Youngbauer of Jelly Belly: "Lexco will be carrying the popular Jelly Belly gourmet jelly bean 10 flavor gift box. This box contains our top selling flavors of Very Cherry, Licorice, Buttered Popcorn, and seven other popular flavors. Our beans are manufactured here in the United States. Taste the beans that Ronald Reagan made famous!" The Jelly Belly gift box wholesale pack includes 12 gift boxes with an MSRP of $6.50 per box. To order, contact Lexco toll-free at (800) 626-6556.